Remove the steering stem upper bearing and steering stem lower bracket. Refer to “steering / steering damper removal and installation” . 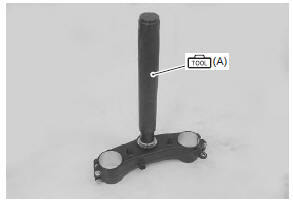 Remove the steering stem lower bearing inner race using a chisel. 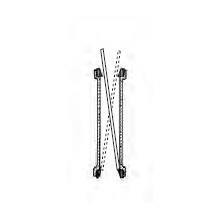 Remove the steering stem upper and lower bearing races using the steel rod. the removed bearings and races should be replaced with new ones. Press in the upper and lower outer races using the special tool. Press in the lower bearing inner race using the special tool. Install the steering. 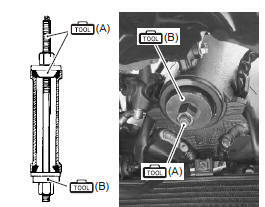 Refer to “steering / steering damper removal and installation” .